As pro-Russian winners were announced Sunday after an election in Donetsk and Luhansk, concerns intensify over a major military movement of troops and equipment from Russia into Ukraine. The movements, which began Sunday and were witnessed by a number of Western journalists, included up to 40 trucks of military equipment and troops. The scenes were initially witnessed by AFP reporters who claim to have seen some trucks carrying anti-aircraft guns heading toward the government-held airport. The movement of the trucks came just hours before election results confirming the new leaders of Donetsk and Luhansk. The scenes echo those witnessed in Crimea in March 2014 when unidentified militias appeared to patrol the streets in the lead-up to a referendum on independence. The men were later confirmed as Russian soldiers. 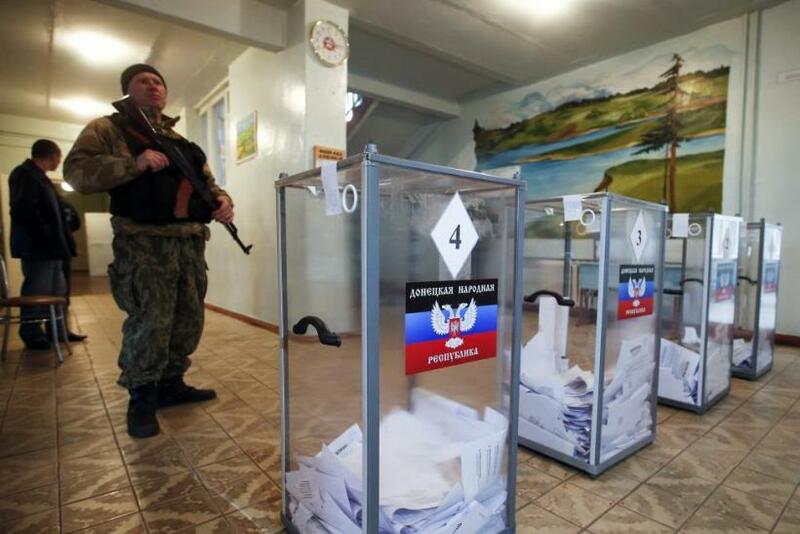 In the controversial elections, which the West has called "illegal," Aleksandr Zakharchenko was elected head of the self-proclaimed Donetsk People’s Republic and Igor Plotnitsky won the vote in the Luhansk People’s Republic. While critics claimed that no real opposition existed in either region to challenge the two men, Russia has framed the Nov. 2 elections as the “will of the people,” and like the referendum in Crimea in March 2014, the results are likely to go unchallenged despite condemnation from Kiev and the West. Other witnesses to the troop movements included reporters from Buzzfeed.com and Mashable.com, whose correspondents both tweeted that they saw a large military column travelling towards Donetsk. BuzzFeed’s Max Seddon wrote: "31 unmarked Kamazes (military trucks) just drove past towards Donetsk. Anti-aircraft weapons, ammunition boxes, radar systems, a bus of gunmen." Colony of 31 unmarked Kamazes just drove past towards Donetsk. Anti-aircraft weapons, ammunition boxes, radar systems, a bus of gunmen. Mashable’s Christopher Miller pegged the figure to be closer to 40. Unverified footage of the troop movements was shown on Ukraine’s channel 5, as a large column of trucks meandered through what can only be indentified as an eastern European city. Russia has repeatedly denied assisting pro-Russian rebels in the east of Ukraine, but was part of the Sept. 5 cease-fire that has seen fighting largely decrease in the East, with the exception of the Donetsk airport, where clashes have continued. Western concerns over Russian influence were raised when pro-Russian rebels were witnessed using advanced and sophisticated weaponry and have had no apparent difficulty in acquiring ammunition. But now that Russia has said it would respect the results of the elections held Sunday, the troops' movements could legitimize the use of a more visible Russian force, should the new leaders of the regions invite them to do so. It has yet to be seen whether the two newly independent regions will be merged with Russia.